As a musician, you should take the time to fully appreciate the equipment and instruments that you use. It is nearly impossible to produce excellent, professional sounding music, without embracing technology. Of course, there are numerous pieces of equipment that you should consider adding to your arsenal. Some of these tend to be more important than others and the best DI direct input box will enhance your sounds, by leaps and bounds. Of course, purchasing one of these devices will be anything, but easy. Within this guide, you will learn all about this box and what to look for, when attempting to make your purchase. What is a DI (Direct Box)? What Does a DI Box Do? How Much Does a DI Cost? A DI is a device, which is frequently utilized in the recording studio. It is used to connect high impedance devices to those with low impedance inputs. Generally, the two devices are connected together utilizing an XLR connector. These devices are frequently used to allow the musician to connect their electric guitar to the microphone input on the mixing console. It is possible to use a DI box for a variety of different purposes. In some cases, one of these boxes can be used on instruments, which do not contain a balanced XLR output. An example of this would be an electronic keyboard, which must be connected to a mixer board. It is also possible for these boxes to be used with acoustic guitars that need to be mixed through a monitor mix or mixing console. So, how does this technology actually work? Well, the box is responsible for taking the high impedance signal, which is currently unbalanced, and transforming it into a lower impedance and balanced signal. This allows the signal to be transported over long cables, without loss of audio or signal. Also, after the impedance has been lower, the signal will become compatible with low impedance inputs, such as mixing consoles or preamps. Without the DI box, the connection would not be feasible or safe. When it comes down to it, there are numerous ways to utilize a DI box. Whether or not you know it, some instrument amplifiers are actually equipped with built-in DI units. These devices can actually be connected directly to the mixing console, without the requirement of an external DI. At the same time, it is possible to utilize the DI alongside a microphone, with the same source. Connecting the DI in between the guitar and your amplifier is another option. This type of configuration is immensely popular among professionals in the sound recording studio. When attempting to shop for a DI box, you should realize that there are many differentials between these products. Some are active, while others are passive. The most significant difference is the fact that an active model contains a preamplifier. Truthfully, active units are much more complex and will provide a gain option. At the same time, you will need a power source, if you wish to use a DI unit. Passive units are much less complicated and some are much less costly. Be careful when purchasing an extremely affordable DI unit, as it may produce an unsatisfying hum. When you decide that you want to acquire one of these products, you should realize that the prices vary significantly. Some of these devices are immensely affordable, but some can be excessively expensive. With this in mind, you should do your best to try and figure out exactly what you want in a DI box. You’ll want to make sure that you obtain the best studio monitors to work in conjunction with your device. Don’t focus too intently on the price figure, as it may be misleading. It does not matter if you are a professional musician or you are trying to make your very own first hit single. You are going to need equipment that will make you sound like a pro. That is exactly what the Radial ProRMP can do for you. Some of the most famous musicians throughout history have been reamping to create a unique sound on their recordings. Products like this cannot only be used on guitars, bass, keyboards and drums, but they can even be utilized with vocals to create a one of a kind sound. The magic behind the Radial ProRMP is located in the transformer, which eliminates buzzing and humming noises. This product is also a passive reamper, which basically means that it does not require any external power whatsoever. 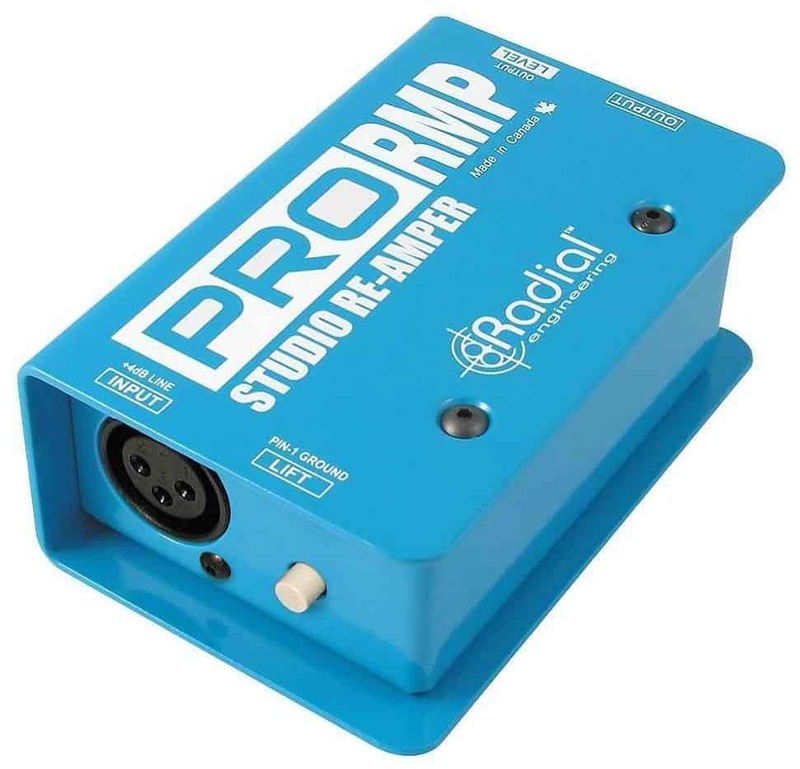 The Radial ProRMP is very user-friendly and all you need to do is just simply just plug it in, you are ready to start recording like the pros. The effects unit does all the work for you and all you need to do is adjust the level. The casing is constructed of 14-gauge steel, which is a very sturdy material that will ensure the durability of the product. This product is considered to be the best passive direct box. Overall, the Radial ProRMP is designed to withstand the test of time. It is very user-friendly and suitable for the amateur or professional musician. Q: Do you need to hold the switch down to use this hoover or can you just switch it on/off? Whether you are a DJ or a guitar god, you have one thing in common. You are going to need the best equipment possible to make you sound your absolute best. The Behringer DI20 Ultra DI can help you with that. This truly is a one of a kind product that can take two separate unbalanced lines and convert them into one balanced output. One of the best things about this great little direct injection box is that it can be used will you a jamming on stage or you can utilize in the studio, while you are recording your tracks. The servo-balanced operation was specifically designed to deliver super flat frequency responses. The box can operate off a 9 Volt battery or it can use phantom power. The 9 Volt will automatically shut off when phantom power is applied. The box is capable of connecting to speakers that have up to 3,000 Watts of output power. The casing is constructed of durable material that ensures durability. You can take this little buy on the road wherever you go. The ground lift switch will eliminate ground loop problems that you would experience with similar products. This is one of the best active DI products. 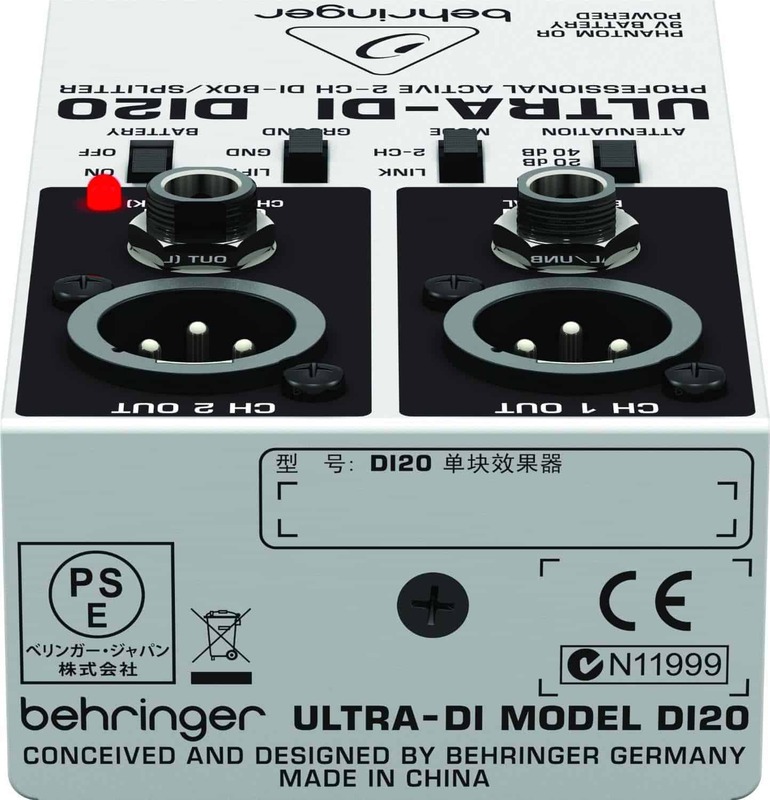 Overall, the Behringer DI20 is designed to offer a long service life. It is very affordable and will suit all types of musicians. If you are looking for a DI box for acoustic guitar, then you should look no further than the LR Baggs. The Para DI is designed to enhance acoustic pickup, so a complex, fuller sound is achieved. It is very reliable and suitable for the amateur or professional musician. You can easily adjust the gain until you achieve the perfect passive or active pickup to suit your needs. The 5 band EQ has a tunable notch with midrange bands that are capable of perfecting the sound quality. This is a battery and electrically powered device. It operates off of a 9-volt battery or a 48-volt phantom power cable. The battery powered option will allow the musician to transport and utilize the DI box for any musical event, studio recording, or from room to room with ease. 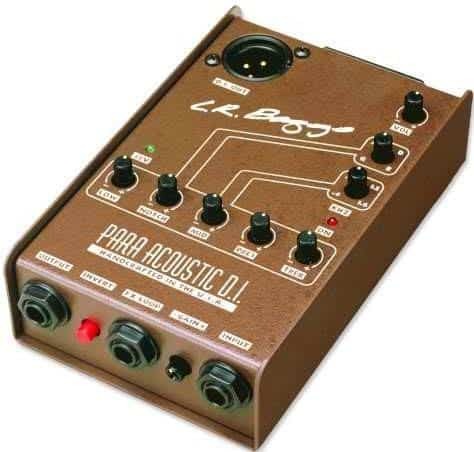 Overall, the LR Baggs Para DI is designed to enhance acoustic guitar sounds. While the price tag may seem unfriendly to some musicians, but the manufacturer’s warranty will make it a little friendlier. As a bassist, you need to the very best equipment to help you sound your best onstage and in the studio. This is where the Ashdown MiBass Interface can come into play. Of course, you might be spending a little extra cash, but you are going to sound like a professional. The Ashdown MiBass was designed specifically with the bass player in mind. This interface allows bass players to connect their instrument right into their computer for recording purposes. The interface also has a DI output, which allows users to plug into a PA system or mixing console. If you want to even take your recording experience to the next level you can download the Ashdown application on your iPad or iPhone. This app will allow users to plug right into their headphones for practice sessions. The VU meter is illuminated giving users an easy to read meter screen. Compatible with MAC or PC’s and there is no need to install additional drivers. The device is powered by a USB cable there isn’t any need for an external power source. However, it can also be powered by a 9 Volt battery. This really is a great DI box for bass. 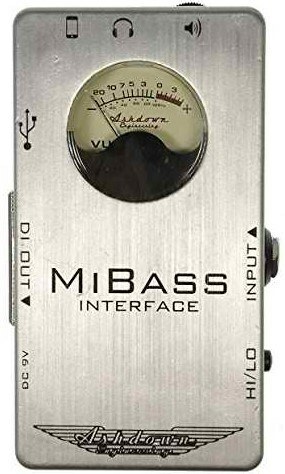 Overall, the Ashdown MiBass interface is designed to outlast the competitor brand by many years. It will perfect your bass sounds every time. The Radial JDI Duplex is a necessity for any home or professional studio. It is equipped with a variety of connectors including a 3.5 millimeter and ¼”. The JDI Duplex is also equipped with an XLR input, which is suitable for +dB professional line sources. This DI box will not alter the sound and as a matter of fact you cannot even hear it, when it is in the operation mode. The Radial JDI has a heavy duty construction and will endure the test of time. The Duplex will enhance connectivity and reduce external noise, even in a very crowded studio. This is a plug and play device that is very user-friendly. This box is perfect for the amateur and professional musician. 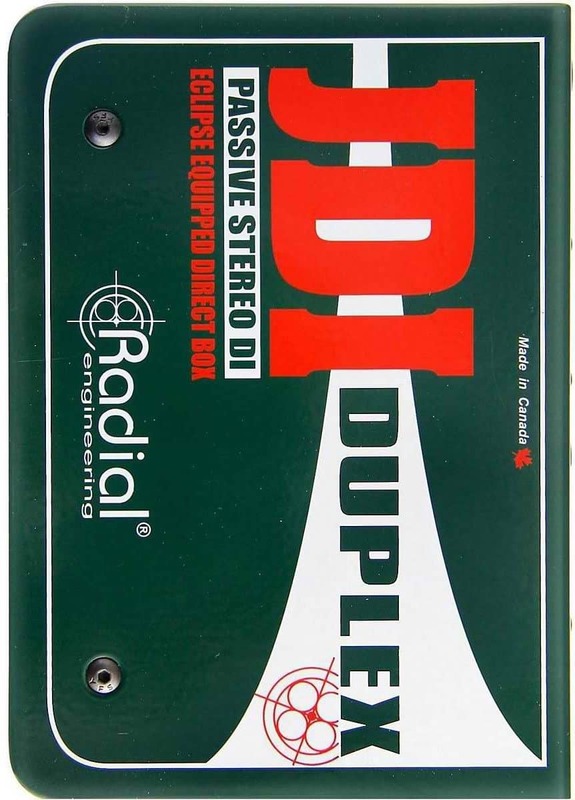 Overall, the Radial JDI Duplex will be a great addition to your musical gear. It is very user-friendly and all you need to do is plug it in and let the DI box do the rest. There are many musicians, who will benefit tremendously from the purchase of a multi-channel DI. The majority of these devices are immensely expensive, but this isn’t always the case. 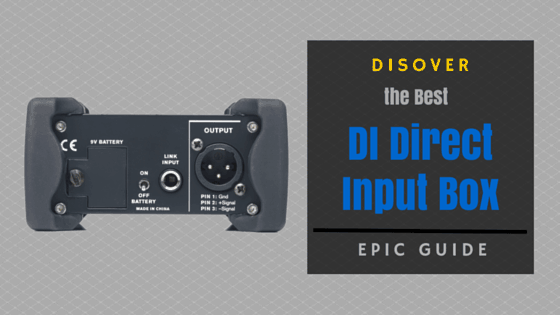 If you wish to save money, but still want to obtain an excellent multi-channel DI, you should definitely check out the Behringer DI800 Ultra-DI Pro. This 8-channel box will give you the ability to use an assortment of different instruments and devices within your recording studio. Although this box is absolutely perfect for studio recording, it is also great for live stage performances! It comes with two power options, including mains and phantom-power. The unit comes with XLR connectors, as well as ¼” TRS connectors. The unit is designed and built with high-quality components to help ensure that it’ll last for a tremendously lengthy period of time. For enhanced audio performance, the unit is equipped with ultra-low noise amplifiers. More pros and cons will be explored below. All in all, there are plenty of excellent features associated with the Behringer DI800. Whether you wish to record in the study or perform live on the stage, this DI box will definitely enhance your music in all facets. If you need the best multi-channel DI box imaginable, this one is well worth checking out right now! All in all, many people will not actually require a DI box. However, there are many musicians, who will agree that it is a necessity. If you fall within the latter category, you will want to do your best to obtain the highest quality box for your own individualist situation. When attempting to purchase one of these boxes, you will want to utilize the information provided to you above. It’ll help guide you in the right direction and guarantee that you get the best box for your own preferences.